Samsung is set to launch its next-generation Galaxy S-series flagships on March 29 at the Galaxy Unpacked event that would be streamed live to viewers around the world. The Samsung Galaxy S8 and its larger sibling, the Galaxy S8 Plus are both expected on that day. 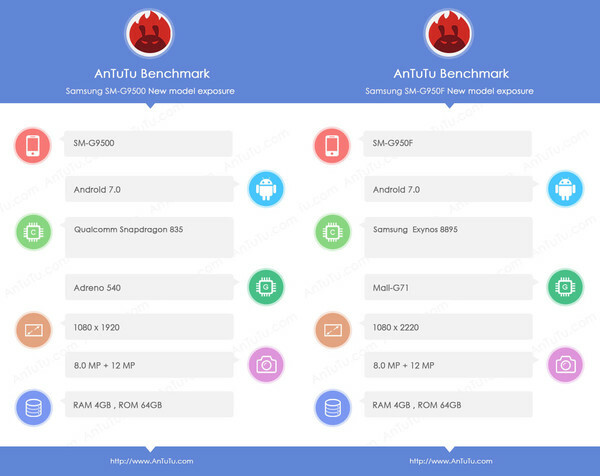 In the face of their imminent launch, popular benchmarking platform AnTuTu benchmark has released the specs data of four models of the Galaxy smartphones which are likely different versions of the Galaxy S8 and Galaxy S8 Plus. The first model SM-G9500 is listed as coming with a Snapdragon 835 processor which means it is likely the model which would hit China. Other details include the Adreno 540 GPU, 4GB of RAM, 64GB of storage, a 12MP rear camera as well as an 8MP front sensor. The next model with number SM-G950F is powered by a Samsung Exynos 8895 chipset, making it likely the international version of the Galaxy S8. Other details remain the apart from the Mali-G71 GPU which would power the graphics. Further, the Samsung SM-G955F model is listed with an Exynos 8895 processor and is suspected to be the international version of the Galaxy S8 Plus. It also features the same 4GB + 64GB memory combo as well as a 12MP sensor at the rear. 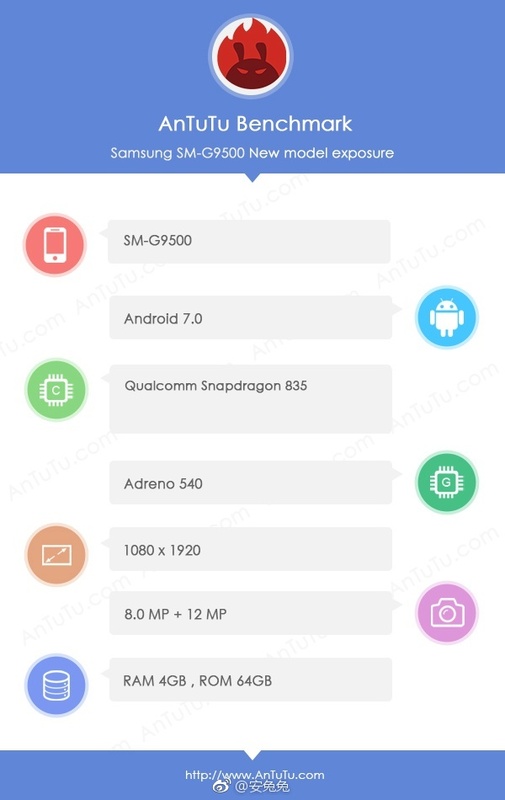 Lastly, the fourth model listed is the SM-955U which is likely the Chinese licensed model of the Galaxy S8 Plus and it packs a Snapdragon 835 chipset onboard as well as an Adreno 540 GPU. There is also 4GB of RAM and 64GB of storage crammed inside the flagship. Also listed is a 12MP rear camera and an 8MP front-facing sensor. It is believed that there would be more than one storage version on all the Galaxy S8 and S8 Plus models when they are eventually launched.